Notes: There is no current release of this movie on DVD in North America, as the former release is long out of print. We can not label this as a "prerelease" digital source, as this *has* been released before. It is, however, currently available streaming on Netflix.com, in dubbed form only. The correct romanization of the hero's name is, in fact, Hols, supposedly of Nordic etymology. We are therefore changing it from "Horus" though it is the traditional listing among most English-language discussions of this work, as this series has no ties whatsoever to Egyptian mythos. This review refers to the film by its original title of Hols: Prince of the Sun. After assisting a rock giant with pulling a sword out of its shoulder, young Hols is informed that it is actually the "Sword of the Sun" and has a special destiny. Soon after, his dying father implores him to return to the village where he was born. Shortly after Horus was born, an ice demon turned the people against each other and his father fled the village with Hols for his safety. Following his father's request, Hols returns to human civilization to find his people and ultimately face off against a ruthless and manipulative ice demon. 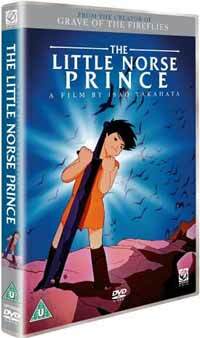 Before getting into the review proper, I should mention that this work was one of the first to feature significant contributions by the future Ghibli power team of Hayao Miyazaki and Isao Takahata. Miyazaki worked on scene design and Takahata on some production and design elements. There is some confusion about whether or not he actually directed the film. The translation of the actual credits of the film list Yasuo Ohtsuka, though in my (admittedly brief) research I've found that the long out of print English version (Little Norse Prince Valiant) listed Takahata as the director, and various French and English websites (I guess this film was really popular in France) claim the same thing. This work is a bit interesting in that it is representative of a period of transition in regards to the Japanese animation industry. Though today many Western fans tend to talk about the typically wider demographic range of anime versus Western animation and the content differences, such elements emerged gradually in Japan for a number of reasons, and the early Japanese animation industry was still heavily influenced by the Western animation industry. This film, which was designed as a children's feature, will on first look remind the viewer of a classic Disney film: talking animal companions, abruptly added singing sequences, and feel-good themes about unity overcoming evil. The presence of such elements isn't necessarily bad (I personally enjoy many Disney films), but it might be off-putting to certain viewers. While the basic central plot of "boy who must face demon" is simple enough, they do add a number of twists including characters who may not be what they seem and Horus having to deal with a number of threats that can't be defeated by bravery alone, such as manipulative village elders or people who are naturally suspicious of outsiders. Granted, the movie was targeted at children, so I can't say that it really comes off as complex, but I still found it engaging enough. There is a fairly equal distribution of action scenes and more character-driven scenes. For the most part all the action scenes all flowed logically from the previous scenes. Initially, I had a bit of problem with the pacing as when the movie begins you are dropped into the middle of an action scene with little explanation and expository yet unrevealing dialogue following it, but once Hols returns to human civilization, the pacing smooths out. The characters are fairly likable. Horus is a brave enough lad with a good heart though perhaps a bit more forgiving then I would be. Despite being betrayed by others he still strives to help them. The real character work, though, goes to a character named Hilda. I can't really talk about her without spoiling the film, but she faces some difficult choices in the film and we do get to see her grapple with some of these issues throughout the short run of the film. I would have liked to have gotten a bit more insight about the ice demon Grunwald. Alas, he is a bit flat in terms of the character development department, though I did appreciate how they had him employ different tactics against the humans he is warring against such as manipulating their already existing prejudices to serve his own ends. As I mentioned earlier, there are a number of talking animal type characters in this film. Though I initially suspected they were their to be comic relief or the requisite cute mascots, they end up simply seeming to be in the film more to represent, particularly in regards to one character, the voices of different moral authorities. The cute factor was actually covered through the use of various young children characters. While perhaps not as philosophically deep as some films, The Little Norse Prince does touch on a number of interesting ideas. From the very beginning of the film, for example, we see that Grunwald has disrupted villages in the past by turning people against each other rather than just outright destruction even though both are in his power. He may be the main villain, but the petty fears and suspicions of the people are making his job that much easier. A power-hungry village elder constantly undermines Hols in a petty attempt for political power even though it is putting the village ultimately at risk. Some of the initially "evil" characters are less evil than they appear as well. There is a strong message about unity in adversity toward the end, the more cynical may find it perhaps a bit hokey, but I felt it fit the film well. I should note that despite the fact that I initially compared to this to some Disney films, Hols, despite being a children's title, is rather serious in tone overall. There are a number of happy moments, but very little actual comedy. This doesn't really harm the film, I think, since the nature of the story they were trying to tell would have been undermined if they included pointless gags just for laughs. Musically, the title is alright if a bit dated. It mostly consists of an older (obviously) orchestral film score punctuated by the occasional somewhat grandiose and/or cutesy song sung about some element of village life. These village songs are a bit abrupt and honestly I think the film would be a bit stronger if they were removed. This title is over thirty years old which might raise some concerns about the visual quality of the work. Well, I would be lying if I tried to claim that Hols can really stand up against today's modern computer-assisted work, but given the age of the title, it isn't too bad either. The character design work are rather simple, but functional. There is a good amount of scene detail in the clothing and general background work. Given that this is set in a quasi-Scandinavian setting involving an ice demon, you don't exactly get a lot of bright color work, but the palette used fit well with what they were trying to do. The colors were a bit faded in the version I saw, but I attribute that to the version I saw being a digital source copy which probably used as source a LD transfer off of old masters to begin with. I was most surprised with the fluidity of the animation in this film particularly the action scenes. Again, while they can't be compared to the best of modern productions, they still are fairly fluid. There are a number of action sequences in the film and I found they were for the most part well animated. The main exception to this involved two different attack scenes on a village in the film. Both of these scenes involved huge numbers of creatures involved, so I suppose it was decided it just wasn't technically feasible to animate them directly so they instead employed a series of representative stills. I hadn't realized how fluid the regular action scene animation was until I saw these scenes. Part of the reason for the general animation quality has to do with the army of people involved in the production of this film. Toei's trailer notes that the film was produced over a period of three years with over 80,000 people working on it and 150,000 cels used. One aspect that really struck me about this whole film is that it used a good fusion of various mythic elements to produce a story which has a very mythic and legendary quality to it without (to the best of my knowledge I could be wrong) actually being directly based on a myth. Even the way the animal characters were used contributed to that feel. Overall, a worthy enough film that has aged surprisingly well.